← “On a Roll 2” and Exhibit up thru September! I had to do another of these rolls of toilet paper. I really liked the colors I used in this and wanted to play further. Those warm reds (cad red light) with cool purple (cobalt violet). Just using a strong, simple form under a single light source to explore the use of color. 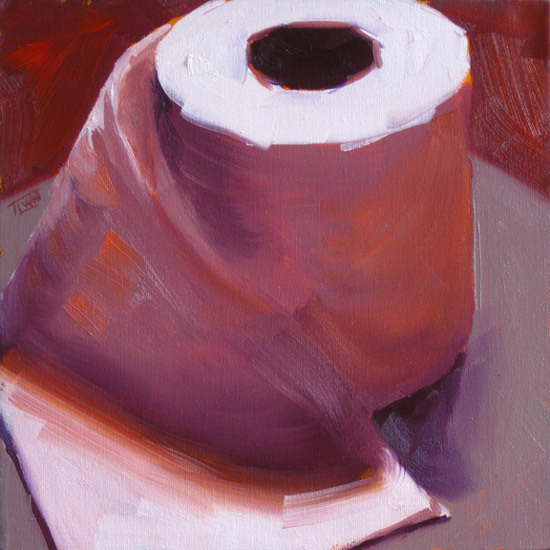 This entry was posted in Calendar, Creative Process, Interiors, My Art, Painting, Still Life and tagged toilet paper. Bookmark the permalink. Thanks Nancy! Having fun w/ those colors!